The Sith Lords are an evil bunch. These followers of the dark side of the force have always taken to being as bad as they can be. We first met Darth Maul as he was sent on a mission to the planet of Tattooine in the outer rim to attack and kill master Qui-Gon Jinn and the young Anakin Skywalker who was so full of potential. He was so skilled with his iconic dual bladed lightsaber that he took on both Qui-Gon and his apprentice, Obi-Wan Kenobi, in one of the most epic lightsaber battles ever. He even killed Qui-Gon before he was sliced in half by Obi-Wan as he fell down a large chute never to be seen again (Or does he come back?). The world may never know for sure what happened, but we like to think he'll be back. He was one of our favorites and maybe he's one of your child's, too. Now your little one will be able to continue the legacy of the great Sith Lord and take on the Jedi in this Star Wars costume. He'll be terrifyingly unstoppable with this Officially Licensed Deluxe Darth Maul Costume. 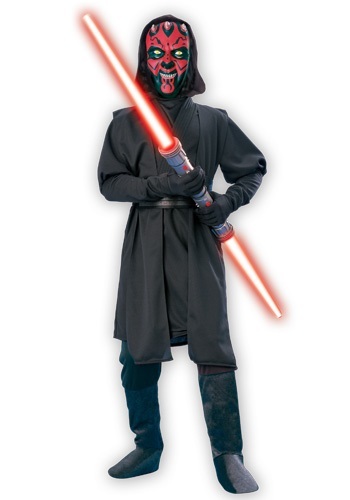 This costume comes complete with a pullover shirt with attached tunic layers, pants with an elastic waistband and attached boot tops, a sash for added detail, as well as the most important part - the plastic mask that will truly transform your child into Darth Maul! He'll be ready to show off his lightsaber skills and use the awesome powers of the dark side of the force at the next Halloween or Star Wars Party. Be sure to grab a pair of black gloves and what kind of Sith Lord would he be without a fantastic lightsaber at his side? Great quality fabric for the costume. The mask was basic plastic but had great color and detail! I bought this for my son, for an event we're attending along with a deluxe Darth Vader. Neither costume looking as good as the pictures. Darth Maul's mask details did not look as good or authentic as the picture and the overall quality of the costume is poor. The fabric on both costumes is very thin. My son's mask is thin is already cracked. I am not sure if this happened in shipping or in the 10 min he wore it while trying it on. The Darth Vader costume was the same deal with the thin low quality mask and the chest & belt details didn't match the picture. I've purchased other similarly priced "deluxe" costumes from other retailers that were much better quality. Overall I can't recommend this retailer for another purchase. We ask that you reach out to the friendly folks in our customer service department. We would like to discuss this with you. My son is very happy with this costume! We shopped around quite a bit locally to find a Darth Maul costume but all we found were cheaply made, poorly fitting costumes. I ordered this and a few days later it was at my door. The mask is a heavy plastic - doesn't look like it will crack or break - fits well and colors are bright. We bought the largest kid size, think it was size 16-18, it fits him great, he's 11 and about 5'2". I ordered a size 8-10 for my 7 year old and it fits perfectly. He's a tad taller than average, but I'd still order up a size. The costume is made of pretty sturdy material and will be warm enough for a cool Halloween evening.